The clinical radiation therapy physicist has a large and important role in the success of clinical trials involving radiation therapy by ensuring that the patients at his/her facility are treated per the protocol specifications, that the treatment equipment is quality assured, and that the treatment plan data and other required dosimetric data are submitted accurately and on time to the quality assurance review center. This role is often not included in the job description or in the calculation of FTEs (full-time equivalents) but can indeed take a significant amount of physics staff time. 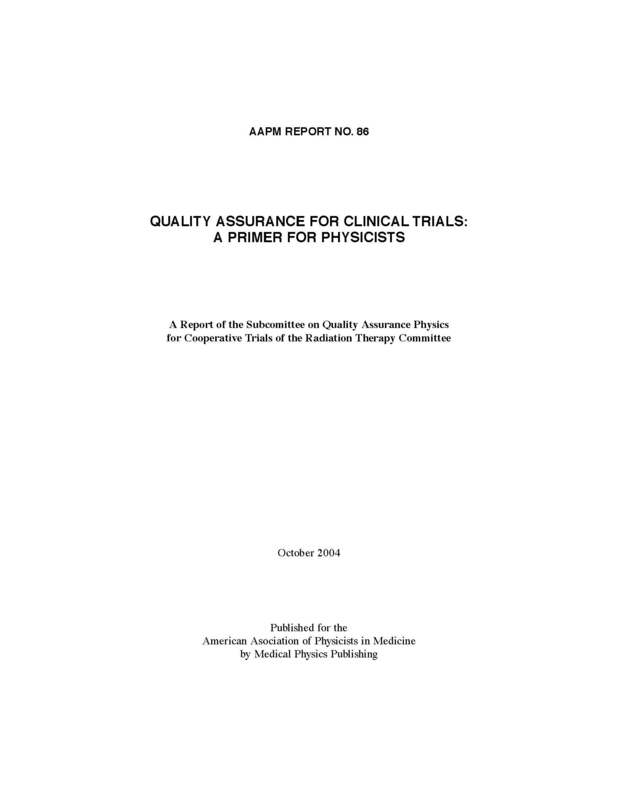 This document can help the physicist to both understand the duties required for assuring protocol compliance and also to serve as a resource to educate administrators and radiation oncologists regarding the physics commitment needed for a successful clinical trials program. As technology advances, the use of radiation therapy in clinical trials becomes more sophisticated. Currently, there are clinical trials that require 3D treatment planning and delivery and electronic data submission to the QA 26 center. More and more protocols will allow and even encourage or require the use of IMRT. This is indeed a new era and the physicist must be aware and able to provide the services necessary to comply with these more complex protocols. In the near future, facilities and their physicists which have not had a significant exposure to clinical trials involving radiation therapy will encounter an increasing number of patients on national clinical trials due to the NCI program to encourage the participation by patients seen at any institution that is credentialed by the RPC. In anticipation of these changes, this document attempts to educate and prepare the physicist to be a competent member of the clinical trial team and for a much more involved role in the treatment of patients on clinical trials in the future.